For other people named Steven Chen, see Steven Chen (disambiguation). Steven Shih Chen (traditional Chinese: 陳士駿; simplified Chinese: 陈士骏; pinyin: Chén Shìjùn; born August 18, 1978) is an American Internet entrepreneur who is one of the co-founders and previous chief technology officer of the video-sharing website YouTube. After having co-founded the company AVOS Systems, Inc. and built the video-sharing app MixBit, he joined Google Ventures in 2014. Chen was born in Taipei, Taiwan. When he was eight years old, he and his family immigrated to the United States and settled in Prospect Heights, Illinois. He went to River Trails Middle School in Mount Prospect for his middle school education and John Hersey High School in Arlington Heights for his freshman year of high school. For his final three years of high school, he attended the Illinois Mathematics and Science Academy in Aurora, Illinois. At the University of Illinois at Urbana-Champaign, he studied computer science. He graduated in 2002. Chen was an employee at PayPal, where he first met Chad Hurley and Jawed Karim. Chen was also an early employee at Facebook, although he left after several months to start YouTube. 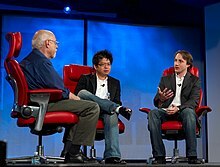 In 2005, Chad Hurley, Jawed Karim and Chen founded YouTube, with Chen having the position of chief technology officer. In June 2006, Chen was named by Business 2.0 as one of "The 50 people who matter now" in business. On October 16, 2006, Chen and Hurley sold YouTube to Google, Inc. for $1.65 billion. Chen received 625,366 shares of Google and an additional 68,721 in a trust as part of the sale. As of 2018, the Google shares are valued at $729 million. He and Hurley started AVOS Systems which acquired Delicious from Yahoo! Inc.
Chen was listed as one of the 15 Asian Scientists To Watch by Asian Scientist Magazine on 15 May 2011. Chen started the live streaming food network called Nom.com in 2016 along with Vijay Karunamurthy. In 2017 that the live streaming food network was shut down, with its Twitter feed switched to private and Facebook account left idle since March, 2017. Chen married Park Ji-hyun, who is now Jamie Chen, a Google Korea product marketing manager, in 2009. They live in San Francisco with their two children. One son was born in July 2010. The Chens are major supporters of the Asian Art Museum of San Francisco where Jamie was appointed a trustee in July 2012. ^ "YouTube Founders Launch New Video-Sharing App MixBit". PC Magazine. ^ "YouTube Co-Founders Split As Hurley Spins Out MixBit And Chen Joins Google Ventures". ^ YouTube: The Company and Its Founders By Rebecca Rowell Retrieved 2017-02-18. ^ "Facebook's First 20 Employees: Where Are They Now?". Business Insider. February 1, 2012. Retrieved April 10, 2012. ^ "The 50 people who matter now". CNN. June 21, 2006. ^ Helft, Miguel (7 February 2007). "YouTube's Payoff: Hundreds of Millions for the Founders" – via NYTimes.com. ^ "The Ultimate List Of 15 Asian Scientists To Watch – Steve Chen". AsianScientist.com. May 15, 2011. Retrieved June 6, 2011. ^ "Nom.com, a foodie-focused live video network from YouTube's Steve Chen, launches with $4.7M – TechCrunch". techcrunch.com. Retrieved 2018-04-24. ^ "YouTube cofounder Steve Chen's foodie livestream network Nom.com has shut down". VentureBeat. 2018-04-18. Retrieved 2018-04-24. ^ "2018 Laureates Announced". The Lincoln Academy of Illinois. Retrieved May 31, 2018. ^ "YouTube Founder Married Korean Woman". ^ Asian Art Museum: Additional support is provided by Jamie and Steve Chen. 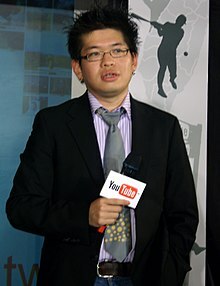 Wikimedia Commons has media related to Steve Chen.